In January I signed up for the Ready To Wear Fast. It's been really fun NOT buying any clothes and instead making new clothes. My style is very casual and I don't work outside the home so my makes have been mostly t-shirts, tops and a few cardigans. 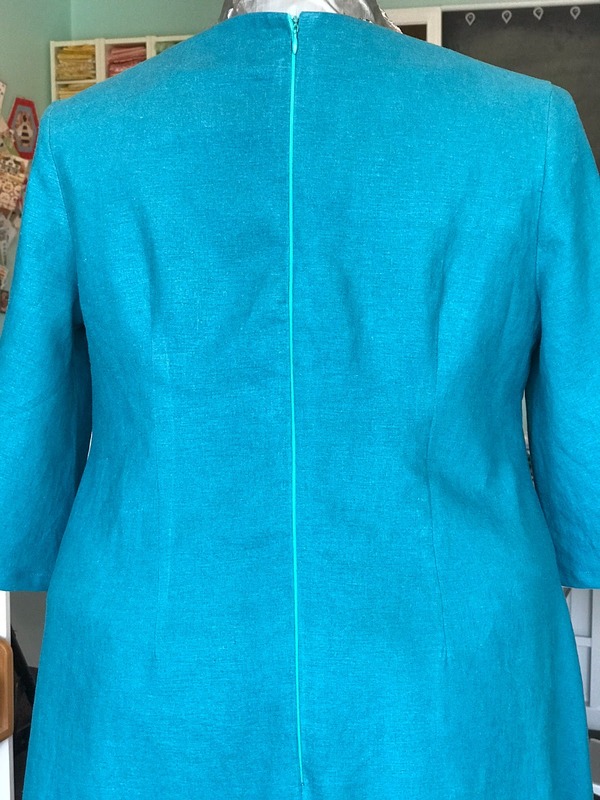 Today I am sharing photos of my most recent finished garments. First up is my Easter dress. This is a pattern (New Look D0270) I have made a few times. 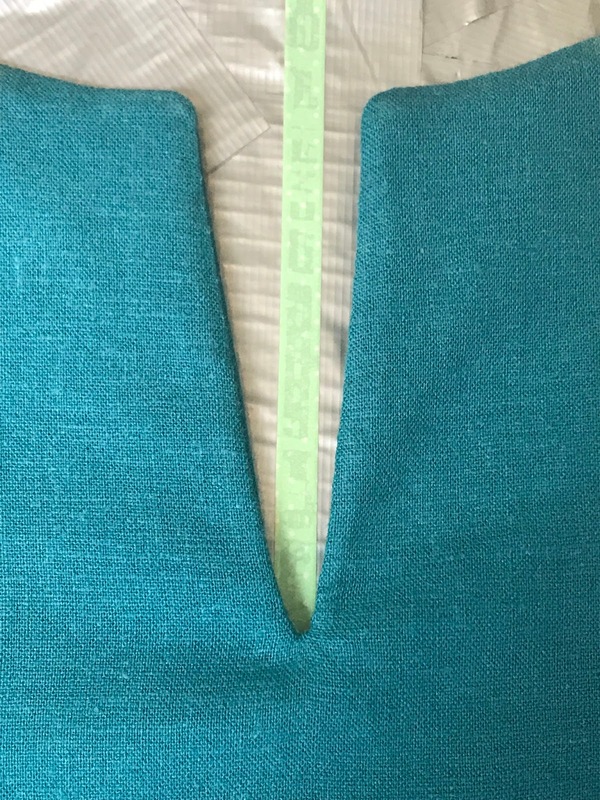 This time I changed the neckline by adding a 4" slit. I also added back darts to correct the fit for my small torso and large hips. The sleeve was a happy mistake. 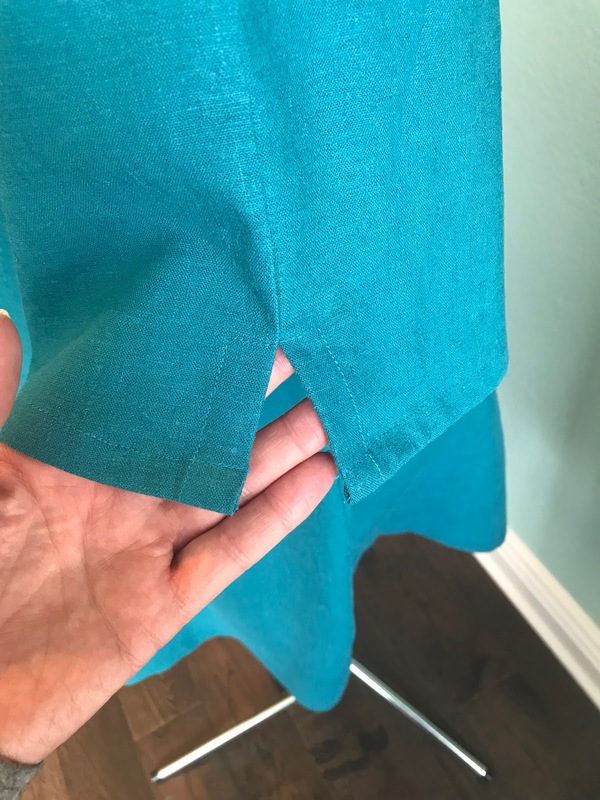 I wanted to make a split sleeve, all the way from the shoulder to the cuff, but the fabric (a rayon and linen blend) was too heavy to drape nicely. Instead, I sewed the seam up the middle of the sleeve and left a slit in the bottom of the hemmed edge of the sleeve. See the close up photos for a better look. I wear t-shirts and jeans almost every day, so getting creative and changing the style or cut of the shirt has been a challenge. I love a good boat neck tee. When I was at Stitch Supply Retreat earlier this month I bought lots of garment fabric. This striped knit (Art Gallery Fabric) is one of my favorites. I also bought the Lark Tee Shirt pattern which has 4 necklines and 4 sleeve options, including a boat neck. Win! Win! One of my favorite boat neck tees from Boden catalog has a contrasting twill tape to finish the neckline, so I tried to do that on this shirt. FAILURE! It didn't lay flat so I cut it off, which made the neckline too big. UGH! I added the binding to help keep this on my shoulders, but it's still a little too big. Wearable, but disappointing. I also made a self-drafted pair of knit pants. My favorite RTW knit pants were getting a little ragged looking, so I cut them apart and made a pattern from them. I found this scuba knit at Joann's and made the pants, which fit perfectly and are so comfortable. They have a fun faux pocket detailing on the hip but it just would not photograph properly. Another Linden Sweatshirt pattern made with Art Gallery Knit fabric. This one is a beautiful pink that will get a lot of wear this summer. My most recent finish is the Charlie Caftan. Made from a rayon chambray by Robert Kaufman fabrics and purchased from Imagine Gnats online shop. This dress is my new favorite. The pattern is by Closet Case Patterns and it was not without its problems. No fault of the pattern designers but more my skills and body shape, made this a difficult make for me. When I first constructed the dress it sat too low through the bodice and making the "waistline" way too low for my short waisted body. I am not considered short at 5"5" but I'm all legs and no body so I always have to make a short waist adjustment. Some Indie pattern designer do not give you a natural waist mark, and because this dress is not a fitted style, I thought I was safe. I will most definitely be making more of these dresses but next time not only will I made the adjustment in the shoulder seams to raise the waistline but I will also raise the V-neckline a bit. It's a little too revealing for me. If you're looking for a comfortable and stylish dress to make, this one's for you...and it has POCKETS! Also made this month at retreat was this cork and waxed canvas purse. 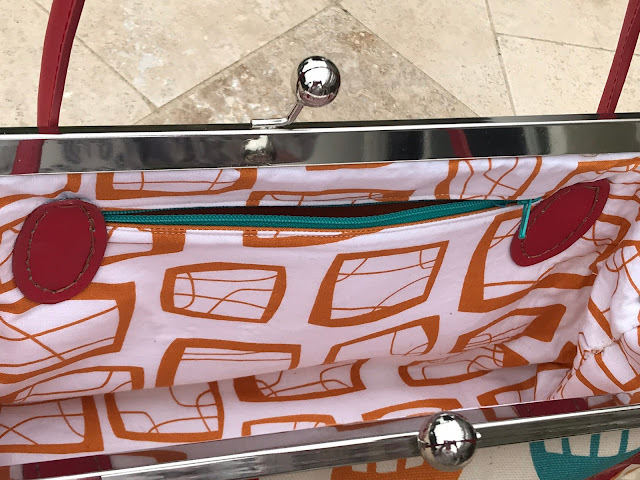 I've always wanted to turn my clutch framed pattern into a handbag but found this pattern at Upstyle Designs on Etsy. It was super easy to follow and to make. The most difficult part was turning the very stiff and thick bag once it was all sewn together. When I was finished with the bag I was so disappointed because I did not realize how small it finished. No worries, because it made the perfect birthday gift for my 10 year old granddaughter. The inside is finished with a fun and playful Cotton and Steel print, with a zip pocket and an open pocket. Because I really wanted to make a purse for myself, I made this one using the instruction from the pattern above, resizing it to fit a 12" frame instead of the 8" as used above. This one is a better size, but if I made another I'd make it 2" taller. I don't like big bags but feel I need a little more room than I got in this bag. I used the same waxed canvas for the bottom of the bag and a canvas print for the focal fabric. 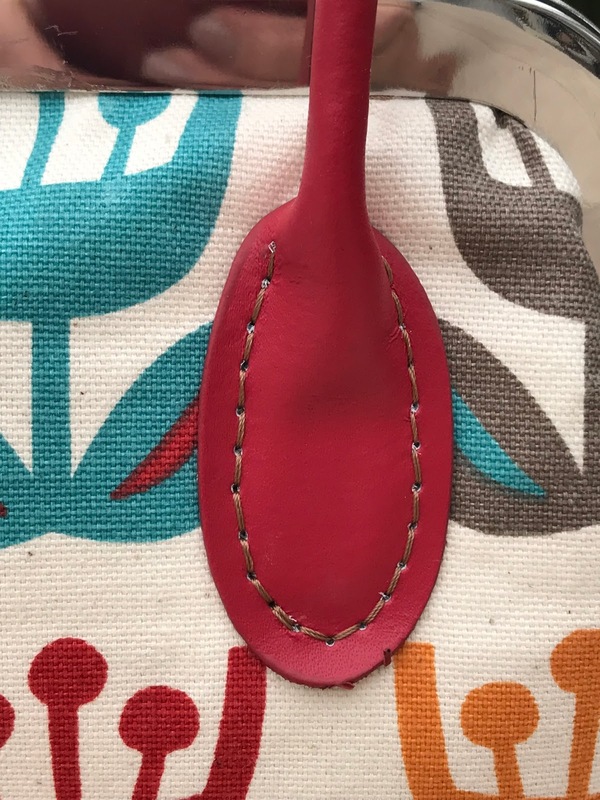 I had purchased these bag handles a few years ago and finally used them in this project. I nearly bruised my thumb sewing them on; trying to match up the holes inside and out was not easy. I used upholstery thread to sew them on, so I think I got a really good attachment. I also used glue to hold them in place while sewing them on to the bag. The inside also has a zipper pocket and a fun print for the lining. I have a stack of garment fabric and new patterns lined up to sew for the summer. But I need to finish a few quilts first. Thanks for reading and thanks for your comments on my new blog header. I just adore your fabric combinations for purses. Great job! I am so impressed with your efforts Di! And how pretty everything looks on you!